In case anyone thinks that I’m just ‘TOGAF-bashing’ for the sake of it, I do believe that TOGAF has genuine value for what it was originally designed to do, namely architecture of enterprise-wide IT-infrastructure. TOGAF 8.1 was actually pretty good at that, though by 2009 it was an urgent need of an update. Yet as I wrote back in February 2009, after the TOGAF 9 launch, to me TOGAF 9 represented a huge missed-opportunity, a disastrous hubris-laden wrong-turn. There were two choices: either stay with IT-architecture, and really develop the meta-architectures so as to make it self-updating to each change in technology (which was well within Open Group’s capabilities and remit); or go all-out to support a true ‘architecture of the enterprise’ (which, as an IT-standards body, Open Group was perhaps not well placed to do). In the end, they chose the worst of both worlds: a vaguely-revamped static framework that couldn’t keep pace with technological change, and that retained the inherently IT-centric ‘BDAT-stack’ yet also pretended that it would still work beyond IT (which, by definition, it can’t). To be blunt, the current version of TOGAF looks like, and is, a classic example of a framework cobbled together out of disparate parts by a 200+ person committee. There are some excellent bits in it – my favourite is probably Bob Weisman’s work on capability-architectures – but overall it’s best described as a bloated, hugely-oversized, often-misleading, largely unusable mess. Even the ADM is a badly-reworked PDCA loop, with a misleadlingly-constrained ‘Act’ phase (ADM Phases B/C/D) and virtually no ‘Check’ phase (no ‘benefits-realisation’ or ‘lessons-learned’ in ADM Phases H/A). Whilst TOGAF 8.1 was an IT-architecture framework that was good at what it did but needed some updating, TOGAF 9 and 9.1 are less-complete IT-architecture frameworks that are desperately pretending to be more than they are, and in practice are just-about usable only for the kind of now quite old big-IT that’s still in use only a specific subset of industries such as banking, insurance, finance and tax. There’s almost nothing in there that will help much, if at all, with mobile or social or internet-of-things or embedded health-technologies or ‘human apps’ such as Amazon’s ‘Mechanical Turk‘, or even key aspects of IT-disaster-recovery, because those are all contexts in which the human is deeply interwoven with the physical-machine is deeply-interwoven with the IT-technical is deeply interwoven with enterprise-purpose – whereas TOGAF and Archimate and the like only tackle the IT, leaving everything else as a supposedly all-but-irrelevant afterthought, a Somebody Else’s Problem. The catch is that, as enterprise-architects, we are that ‘Somebody Else’: it’s our Problem. And we need real usable tools and frameworks to help us with that problem. Yet despite its vaunted claims to the contrary, TOGAF 9.1 is most definitely not one of them: it’s unsuited for the purpose, right down to the deepest roots of its internal architecture. But because it sits there like a dog-in-the-manger, hogging almost the entirety of that space, we’re stuck: none of us can move forward until we have some means to fix the resultant TOGAF-driven IT-centric mess. It needs to be able to cover any scope and context, consistent yet self-adapting to all those different contexts. It needs to be able to work on any subsets of the overall scope, whilst still retaining full connection to that overall scope. 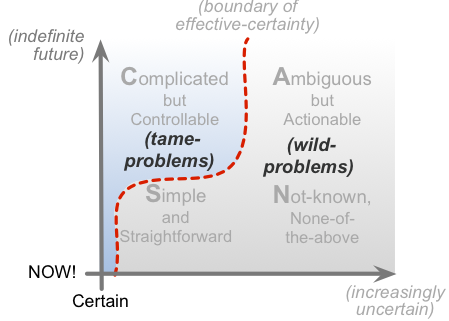 It needs to be able to work with and develop for often-extreme uncertainty. It needs to support the full range from big-picture to detail-level, and from vision and strategy to implementation and operation. It needs to support continuous-learning and continuous improvement. In a business-sense, it needs to support real business-value. No doubt you’ve noticed all of the differences. But have you noticed why the differences exist, and what they imply in practice? Implicit from the arrows on the graphic is that it is possible to use it in a non-linear way – though this is barely described in the documentation, with no actual instructions on how to do it. Implicit from the arrows on the graphic is that it can likewise be used in a non-linear way – but also fully-recursive, via the ‘any scope, any scale’ structure of Phases A to D.
Nothing much wrong with having a method like that of the ADM, that only works well with one type of scope and context, of course – as long as that scope and context are all it’d be used for. The catch is that, courtesy of the hype-machine that is behind TOGAF these days, the graphic on the left is insistently marketed and ‘sold’ as if it’s the graphic on the right – as if the tiny subset of scope that the TOGAF ADM can cover is all that anyone would ever need in enterprise-architecture. Which it isn’t. Which, since TOGAF can’t actually handle anything more than a very narrow type of scope – because that scope is hardwired right into its very structure – makes life very difficult indeed for those of us who do work at wider scopes and the rest of that list of criteria near the start of this post, and have to spend inordinate effort tidying up the TOGAF-created mess. Proprietary frameworks are bad news all round: that’s all that need be said on that. That’s because TOGAF itself is too incomplete to use ‘as-is’: there are key chunks missing, which means that it is, in effect, misleadingly useless, giving the impression of usability without actually providing it – kind of like a car that looks all shiny and new and ready to go but with key less-visible components like the drive-shaft and the steering-rods somehow just not there. In fact on its own, ‘out of the box’, the only people who could use TOGAF are those who already know enough real-world EA to be able to do without it – so the whole thing is all a bit moot anyway. True non-proprietary frameworks for EA do indeed exist: Kevin Smith’s PEAF and POET pairing is one that comes immediately to mind. Milan Guenther’s book ‘Intersection‘, on enterprise design, and Marlies Steenbergen and Martin Van Den Berg’s ‘Building An Enterprise Architecture Practice‘, on the DyA framework, are a lot more complete and usable than TOGAF, and also both come close to true non-proprietary, too: to get the full detail you’d have to buy the book, but that’s all. To me the ideal would be some form of open-source architecture-framework – but it still doesn’t seem to be happening in any workable form as yet. Oh well. This is probably the single most misleading mistake in the whole of TOGAF, yet in some ways one of the hardest to see: conflating ‘enterprise’ as a scope, with ‘enterprise’ as a domain in its own right. In its Introduction, the TOGAF specification does define ‘enterprise’ in several ways: an organisation, a consortium of organisations, and so on. But what it doesn’t do is say – anywhere, as far as I can tell – that this is merely the scope of interest, to which all of the following specification would apply. It’s IT-architecture at an enterprise-wide scale, yes – but that’s not the same as ‘enterprise-architecture’, the literal ‘architecture of the enterprise’, where the enterprise itself is the domain of interest. Yet TOGAF strongly implies, throughout the specification, that the organisation itself is ‘the enterprise’, the ultimate boundary of any architecture. As described in that ‘Organisation and enterprise’ post, this has serious consequences if we try to apply it at a business-architecture level, and often below that level as well. In TOGAF itself, Information-Systems Architecture may optionally be split into Data-Architecture and Applications-Architecture – hence the respective initials that give us that acronym ‘BDAT’, ‘Business, Data, Applications, Technology’. Looking closer at the specification, it quickly becomes clear that each of these ‘architectures’ revolves entirely around what we might call ‘big-IT’ – the kind of systems run by an ‘IT Department’ of a large organisation of perhaps half a decade ago. 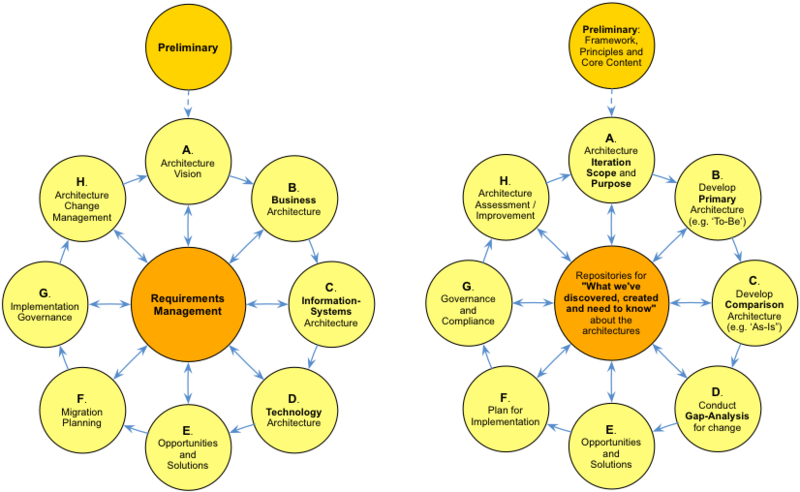 It’s really obvious, for example, that the supposed ‘Business Architecture’ is barely about business at all, but could instead be summarised by the phrase ‘anything not-IT that might affect IT’. The BDAT-stack is actually quite a good description of what’s needed for a big-IT infrastructure-architecture, where – in terms of that ‘enterprise’ model just above – ‘Information-Systems Architecture’ is the metaphoric equivalent of ‘suppliers and customers’, and ‘Business Architecture’ is the metaphoric equivalent of the ‘market’-space for that big-IT. 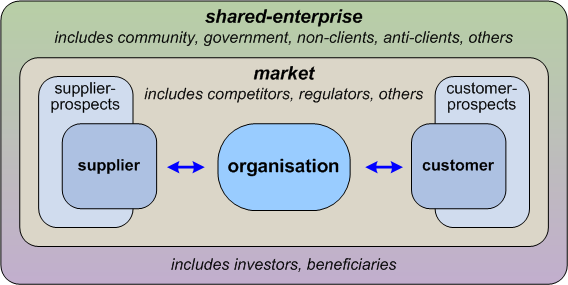 But we need to realise that that ‘enterprise’-model won’t work upside-down: looking ‘up’ the stack is like looking upward from the bottom of a well, but looking ‘down’ the stack needs to take into account the whole context – of which the well itself is only one small part. Given that in most large-organisations their big-IT accounts for less than 10% of overall spend – and often a lot less than that – then it should be clear trying to claim as ‘enterprise-architecture’ an architectural model that can at best only describe perhaps one-tenth of the organisation’s concerns is somewhere between laughable and downright dangerous. Let’s be blunt about this: the real world contains a lot more than just big-IT. Which means, also bluntly, that the ‘BDAT’ stack – fundamental to both TOGAF and Archimate, and the basis for Phases B, C and D in the TOGAF ADM – is misleadingly unusable for anything beyond IT-infrastructure architecture. Its descriptions even of Information-Systems Architecture, let alone Business-Architecture, are too incomplete and too misleading to be used for anything more than that. There’s quite a nice metamodel in TOGAF 9, and nicely extended in TOGAF 9.1. It’s a very nice summary of the entities needed to describe a big-IT infrastructure and its business-context. But that is all that it can or should be used for: period. It’s usable solely for a very small subset of the enterprise: yet what we need – even for a real IT-architecture – must, by definition, be able to describe anything in that real-world enterprise. Which, unfortunately, the TOGAF metamodel actively prevents us from being able to do. 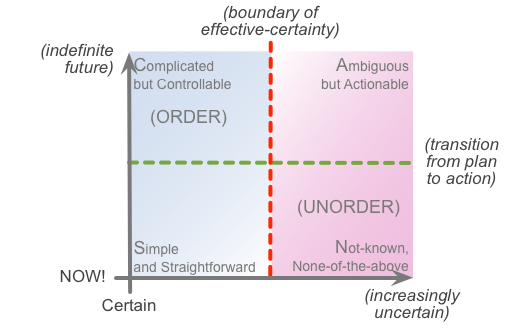 If you doubt this, try using the TOGAF metamodel to describe any whole-of-context business concern such as security or disaster-recovery, in which human activities and mechanical structures are necessarily ‘equal-citizens’ alongside the IT-based apps. Try using it to describe the relationships between information about a parcel, versus the parcel itself, in a logistics context where something’s gone missing. Try using it to describe the whole context for mobile, social, programmable-hardware, an assembly-line, even a data-centre – let alone anything that centres more around physical-machines or people. It doesn’t work: many if not most of the entities we need simply don’t exist in the metamodel – and its arbitrary, unexamined assumptions just get in the way. The BDAT-stack and the TOGAF metamodel lead inevitably towards an IT-centric architecture. Which is fine, of course, in those specific cases where the IT is the centre of concern – but a huge problem when it isn’t. The real-world, however, always includes ambiguities, uncertainties and other forms of unorder. Which means that a framework that barely acknowledges even the existence of such things – let alone their real-world prevalence – is inevitably going to be deeply misleading. IT is great for mass-sameness, of course. The catch is that the very characteristics that make it great for mass-sameness are those that make it often deeply-unsuited to mass-uniqueness – which, in reality, resides right at the core of many industries and domains, such as healthcare, customer-service, retail, marketing, sales, agriculture and information-search. The inherent IT-centrism of TOGAF and the like is really unhelpful whenever we need to develop enterprise-architectures for such domains. Yet another frustration: reference-architectures. At present, the two TOGAF reference-frameworks – TRM and IIIRM – are both so long out-of-date that at one Open Group conference, Allen Brown himself recommended that they should be dropped. But rather than a mere replacement reference-architecture that will likewise go out of date in a couple of years at most, what we most need instead is advice on how to create and maintain a reference-architecture – perhaps using the existing TRM and IIIRM as worked-examples. We also need such reference-architectures to explain their respective ‘It depends‘ constraints and variances – at least to the level of the MoSCoW set, as a minimum. Yet there’s still almost nothing at all on that in the so-called ‘standard’. Bah. Where it sits is primarily at the earlier stages of the Apprentice phase, where the learner is just starting to move out of ‘follow-the-instructions’, and move ‘upward’ into the first levels of the theory behind those instructions. Yet the focus is still on rote-learning, ‘by the book’: it’s all theory, there’s no requirement for real-world practice. Certification, ah, certification… probably the biggest bugbear about TOGAF that most of us have in enterprise-architecture, bluntly. The TOGAF certification comes in two parts: Level 1 (Foundation) and Level 2 (Certified). In essence, Level 1 tests whether the candidate knows the terminology; Level 2 tests knowledge of the full specification. Both of them are only at a rote-learning level: they can’t be more than that, because a TOGAF training-course is only a few days’-worth at most. There’s no skills-test at all – and the whole thing is tested via machine-based multiple-choice exam, which is exactly how not to test for skills-knowledge. Given – as above – that several key parts of the TOGAF specification are not merely incomplete but just plain wrong, then all that ‘certification’ means is that someone has read wrong material well enough to pass a multiple-choice exam that has no connection whatsoever to any real-world context. So in effect, TOGAF certification tests whether you’ve learnt the content of the book, which itself doesn’t connect much or, in some areas, at all, with real-world practice – in other words, not far off a work of wistful fiction. And, starting from that already largely-fictional story, it then demands true/false answers for decision-contexts that in real-world practice are always riddled with ‘It depends’ contextualities. In what possible way could anyone claim that that would be anything other than meaningless, or worse? The certification itself, like any certification, can’t mean any more than that [someone has been tested for rote-knowledge], and doesn’t purport to. And yet I don’t know whether to celebrate on their behalf, or weep for the rest of us. The latter, mostly… This supposed success of TOGAF in the marketplace is actually a ‘success’ that, as we can see from all of the above, is built on exactly how not to do ‘the architecture of the enterprise’ – which means that the real mess is getting worse with every passing day. For everyone’s sake, it really is time that all of us should call a halt on the TOGAF hype-machine, and put that bewretched ‘EA’-framework back into the IT-only box where it does and must belong. Yet for ‘the architecture of the enterprise’, turns out there is no baby in the TOGAF bathwater – just a rubber duck, a worn-out blob of soap, and a couple of mismatched socks left over from last week’s washing. Nothing much that’s worth keeping, anyway. Storm in a bathtub, mostly. But with a lot of money riding on it, hence a lot of dollar-laden delusions too. “Why do I loathe thee, TOGAF? Let me count the ways…” Well, that’s some of the ways and whys, anyway. As an expert in IT-centrism (working more than 25 years in the IT infrastructure business now) I must disagree! IMHO the BDAT-stack, TOGAF and especially ArchiMate are not very useful (understatement) for IT-infrastructures because they don’t follow the “Use real-world rules about how things relate to each other to improve efficiency. Use knowledge to eliminate the mundane and speed critical decisions. Pay attention to the details” principle (from the BIG BIM, litte bim book). Yep, understood. I was trying to be polite about TOGAF in at least some areas, is all. TOGAF establishes many unemployable practices that leave the trainee and practitioner bewildered in practice. 1. the requirements bubble at the centre of ADM makes no sense. It is the strategy not the requirements that drive the enterprise transformation and target EA. 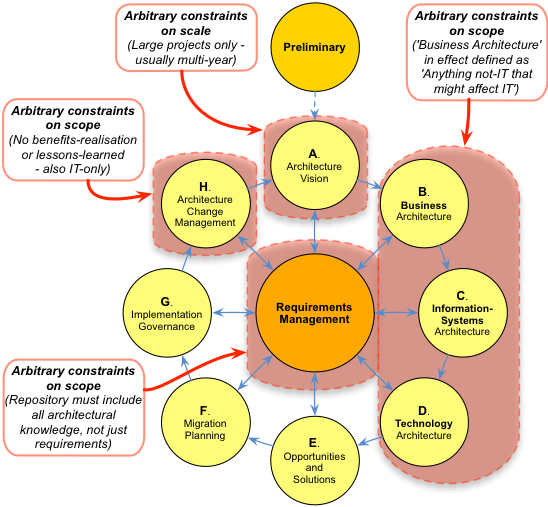 Requirements are collected only for solutions architectures. Imagine the mound of requirements collected for the whole enterprise. 2. It is the enterprise vision in the preparatory phase rather than architecture vision because the latter may only result later after the gap analysis and modeling anyhow. But if you dare state today that TOGAF has fundamental flaws you experience the wrath of the TOGAF community because you affect their credibility. I hope that TOGAF community is open enough to discuss an objective opinion rather than ignore it, keep a moody silence or execute the messenger. It is high time that professionals with reputation in the field do something for this discipline that is besieged by unprofessionals, faux frameworks, trainings, certifications that take advantage of the EA confusion. Agreed. No doubt some people would say that my work is ‘faux frameworks’, too. 😐 But yes, we do need to do something concrete about it, rather than solely complain about the many ‘failings’ of TOGAF when people try to use it outside of the domains for which it was originally intended. yes, indeed TOGAF is basically “junk”, as I have been telling clients for many years, often to their surprise. Unfortunately, we seem to have few other options for the foundation on which to build a more professional approach to EA and to drive out the imposters and charlatans. Yes, there are many other frameworks as well as organisations dedicated to the “professionalization” of EA, but as far as I can see most of these are not that much different to TOGAF and none has really achieved the critical mass needed for success. I have serious doubts whether the Open Group is the best organisation to create and manage an EA framework, but to their credit they have managed to create a fairly successful market around TOGAF training and accreditation. The sad fact is, being TOGAF certified is just about the only way an individual can mark themselves out today as being a professional enterprise architect. Because of the shortcomings of TOGAF, this is both meaningless and dangerous. Moreover, it creates a serious problem for the industry as well as those of us who really practice EA! So what to do? I don’t know. Stop calling what we do EA and distance ourselves from things like TOGAF, perhaps? Try and force the Open Group into relinquishing control of TOGAF and allow it to be updated by real practitioners? Endorse some other framework and/or organisation? Start something entirely new? None of the options seem particularly appealing to me right now. What do you think? Strong agree there: it’s a huge problem. The more ‘successful’ that Open Group is in marketing TOGAF ‘as’ enterprise-architecture, the more damage they cause the entire discipline and industry. That’s one option that we definitely can’t have, for the simple reason that TOGAF is, literally, ‘The Open Group Architecture Framework’ – it belongs always to the Open Group, by definition. I’ll agree there: I must admit I feel more than a bit stuck about this. Open Group were one of the few that had (and have) the ability to manage a wildly-disparate community and get a framework out of it that’s at least useful for something: they’ve badly mislabelled and mismarketed TOGAF, but it does at least exist, and yes, they do indeed deserve credit for that. For the rest of us, often the best we seem to be able to do is indulge in endless and pointless bickering-matches on LinkedIn, and get nothing useful out of any of it at all. Kinda dispiriting, really… Oh well. I note also that the BCS is holding a debate on “professionalism [and accountability] for IT architects” in London on 24 November. I’m not convinced this is the right organisation for EA any more than the Open Group, but I am intrigued as to what they might have to say on the matter. A similar credibility problem exists in the pure IT and solution architecture space. Mike and Tom, I concur. I also believe that an organization to sponsor an independent harmonisation effort in the EA domain would be welcome. Rather than starting from scratch the effort should be directed to analysing existing EA approaches, objectively, by a selected expert group. They should produce according to a set list of deliverables, such as modeling framework, metamodel, process… paying due credits to sources. The result would be a best of breed EA approach. It can be ten pages long rather than 800+. Their work should be transparent and open to public input afterwards. The problem is what “independent” organization would embark in this risky endeavour where results are not guaranteed but costs are. Perhaps an EA tool maker or a government. It would have been the task of a group like Open Group but they will, most probably, continue to defend TOGAF because it pays the bills. Perhaps a competing association that deals in business , process or organization architectures rather than IT. In my profession (x.kind-of-architect) at a global fashion retailer I tend to reason about these concepts as contexts, interactions (man/machine, machine/machine, man/man) and sustainability (where we handle all our constraints of resources, capacities, knowledge etc. e.g. stuff that can be scarce and/or abundant). If I do it well the earning may come as confidence in form of decisions that can make things happen. Glad it’s been useful, Peo – many thanks! Tom, you’re openly saying a couple of things I am often thinking. Consider the difference between the BPMN and UML licenses and the TOGAF and ArchiMate licenses. This also hinders proliferation of the standards. I have no problem with having to pay to use something, but the $2500/year minimum excludes all but the companies that have turned exploiting it commercially into a walled garden. $250/year for an individual/small company, I would find appropriate to support the development of the ArchiMate standard and be able to use it commercially. Anyway, having to pay to use it commercially means that as far as I’m concerned the TOG standards are not `open’ (like UML and BPMN) and TOG is indeed more a `collusion of companies’. TOGAF and ArchiMate are indeed IT-centric. For TOGAF, that seems to be a bigger problem to me than for ArchiMate (as ArchiMate can be easily combined with other ‘languages’, whereas TOGAF is supposed to be all-encompassing for EA governance. But TOGAF has bigger problems than being IT-centric. Its biggest problem is being a fat waterfall. You’re change of scope focus is fine, but the other problem remains. Gerben, very strong agree on the ‘fat waterfall’ problem (or rather, that fat-waterfall is the only option available). I obviously didn’t have enough space to explain it properly, but the metamethod (the right-hand side of the ‘Spot The Difference’ is explicitly designed to work not just with any scope, but any scale as well. In practice, we were able to get even a formal version of that cycle down to well under an hour, and an informal one could literally take seconds, used just as a checklist. This is a really nice article and should be required reading for EA that have been in the job for 3 years or more. It should also be required reading for every member of the Open Group Architecture Forum, the folks who manage TOGAF. I agree with some of your points and disagree with some of your points. But my most fundamental disagreement is with how to use TOGAF. I firmly believe that TOGAF is an excellent approach to help someone transition into Architecture, whether it be from App Dev, Operations, Business Analysis or wherever. It provides a great foundation for architecture work. But to your point, it really needs some thought and supplements to allow it to continue to work in the more mature individual or organization. For those folks, Architecture can and should be much more. When I talk to people about EA and EA maturity, I use a four step model as outlined at https://www.linkedin.com/pulse/enterprise-architecture-maturity-michael-fulton?published=t In this context, I believe TOGAF is helpful for Levels 1 and 2 and I believe needs a lot of additional supplement for Levels 3 and 4. Tom, based on the conversation, you may be almost exclusively working at level 4, which is likely why you see TOGAF the way you do. Thanks for the kind comments there, Michael – much appreciated! I agree that TOGAF is a good approach “to help someone transition into Architecture”, if they’re coming from an IT-oriented background (e.g. as per the ‘Level 1’ in your maturity-model), and also if there’s a broader framework also already in place that appropriately positions TOGAF within the broader EA context. The catch, of course, is that TOGAF frequently pretends to already be a complete description of that broader context – which it isn’t it. In that sense, yes, I can see that you’d probably interpret my work as being “almost exclusively working at Level 4” – because that’s the only place that your current model allows for anything non-IT to be architected. In other words, the same misframing as in TOGAF itself, where ‘Business Architecture’ is in essence just a random grab-bag for ‘anything not-IT that might affect IT’. Instead, the way I view EA – and it’s based the work we did at Australia Post and elsewhere, a decade and more ago – is that, for example, there’s no such role as an IT Solution Architect: instead, the Solution Architect covers the whole of the solution, fully cross-domain – IT, people, process, machines, physical facilities, legal, compliance, training, lifecycles, whatever. 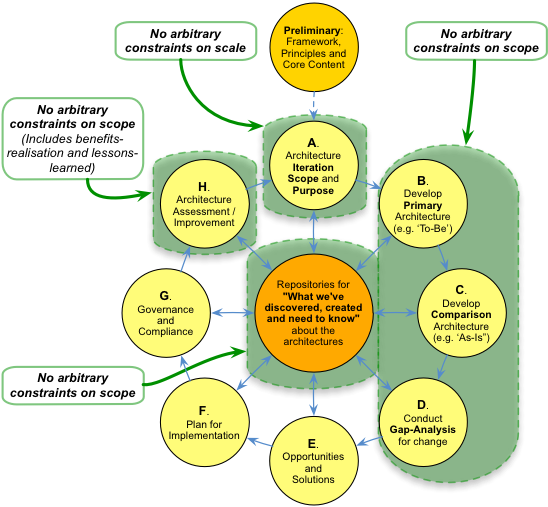 Breaking the solution up into IT versus not-IT, and keeping everything partitioned along silo-boundaries, will all but guarantee a failed architecture for that solution: Not A Good Idea…? Happy to talk about this further offline, if you wish.